Already one of the top recruits in the class of 2018, Zion Williamson was able to further bolster his stock last week with a victory in the dunk contest, an impressive couple of scrimmages, and a highly efficient performance in the Elite 24 game (10-10 from the field), despite being the youngest player in attendance having just turned 16 years old. Williamson was one of the more physically imposing players participating in the event, and while at first glance you wouldn't think he's an elite athlete, that's far from the case. At 6'7, 230 pounds, Williamson is incredibly physically mature for being just 16 years old, and is an explosive leaper who has the ability to dunk everything on his way to the rim and in transition. He's smooth athletically, nimble in traffic, and possesses excellent body control that makes it hard for kids his age to stop him when he is going downhill to the rim. The rest of his offensive game remains a work in progress, but he shows glimpses of skills in the half court that he will certainly have to develop before he gets to the college level. He can take his defender off the dribble in a straight line from the perimeter, and throw in the occasional jumper, but prefers operating inside the paint, knowing he can finish everything around the basket. 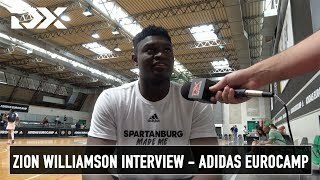 Williamson is fresh off a state championship with Spartanburg Day in South Carolina, and has followed that up with a successful summer which included an MVP performance at the NBPA Top 100 camp, a productive 12 games on the Adidas Gauntlet circuit, and a strong showing at the adidas Nations camp. Williamson will be one of the most sought after recruits in the class of 2018, and has two years of high school basketball left to let his skill level catch up to his pure physical and athletic abilities. It will be interesting to see if he has another inch or two left of growth left, as he's somewhat caught between the forward positions at the moment at just 6'7. Playing 77 minutes over the course of just three games, Zion Williamson led the entire tournament in PER (40.1) despite having turned 16 just a month ago. Williamson scored nearly a point per minute (60 in 77) on outrageous efficiency (82% 2P%, 1-1 3P, 77% FT%), demonstrating advanced instincts for putting the ball in the basket. Very undersized at around 6'6 or 6'7, Williamson has long arms, big hands and a strong frame to compensate for his lack of height as a big man, and is more athletic than he appears on first glance. He is fluid, nimble and very quick off his feet, demonstrating outstanding body control that makes him very difficult for other players his age to handle when considering his strength and dexterity. He's also fairly skilled, showing the ability to create his own shot from the perimeter with impressive footwork and ball-handling skills, making him a difficult matchup in one on one situations that most big men his age simply aren't accustomed to dealing with. He's a handful to deal with in the post as he's difficult to keep a body on, and will try to tear the rim down exploding off two feet if given the opportunity. He even shows some ability to knock down jump-shots off the dribble with solld form and touch, although he doesn't quite know his limitations in this area just yet, having a tendency to force the issue and freeze out his teammates at times. He's not a great passer on top of that, being extremely focused on trying to score almost every time he touches the ball. Left-handed, he wants to get back to his dominant hand almost at all costs, which can make him a little predictable at times with his moves. Defensively, Williamson has some impressive instincts, being the type of player who is always around the ball thanks to his natural feel for the game, but doesn't show much interest in making his presence felt on this end of the floor at this stage. His intensity level is low, as he's usually standing straight up rather than trying to get into a fundamentally sound stance, and doesn't show any urgency in closing out on the perimeter or putting a body on opponents. This isn't rare for a player his age, but considering his lack of size, he'll need to put a better effort in to not emerge as a liability in this area down the road. Only going into his junior year of high school, Williamson is still at a very early stage of his development, but shows a lot of promise offensively as evidenced by the gaudy scoring totals he produced against mostly older players. He's already heralded as one of the top prospects in his high school class, and did nothing to discourage that notion with his play at the adidas Nations. It will be interesting to see if he has another growth spurt left in him.